Manager Dealt Cocaine and Crack Out of Bronx McDonald’s: Pros. Police have arrested a Bronx man for allegedly dealing thousands of dollars worth of crack and cocaine out of a McDonald's he managed, prosecutors say. 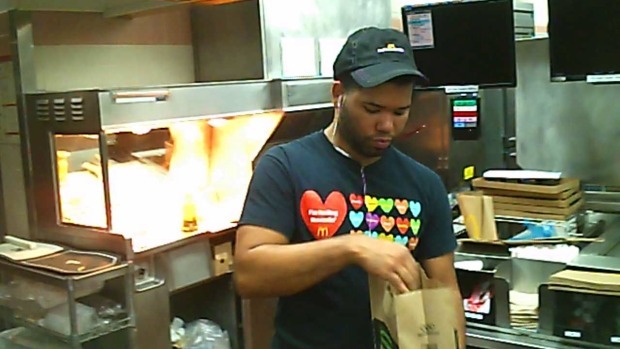 Frank Guerrero, 26, was arrested by NYPD and ICE Homeland Secruity Investigation agents early Wednesday morning at the 24-hour McDonald’s where he was night shift manager for eight years, according to prosecutors. Major Drug Ring Flew Coke, Heroin on Flights to JFK: Pros. Guerrero allegedly sold nearly $10,900 worth of cocaine and crack to an undercover officer over the course of eight occasions at the Bruckner Boulevard location in Pelham. On at least two occasions, Guerrero put the cocaine into a cookie bag, which he then place inside a larger McDonald’s order containing burgers and fries, prosecutors allege. He hid drugs in a soap dispenser, where he'd retrieve it before placing it in plastic bags, according to prosecutors. On Sept. 22, Guerrero sold 100 grams of cocaine and a quantity of crack to the undercover officer for $6,250 inside the franchise’s restroom, prosecutors say. After making the deal, the officer took a seat at a booth, where Guerrero served him a bag of food with the drugs, according to prosecutors. 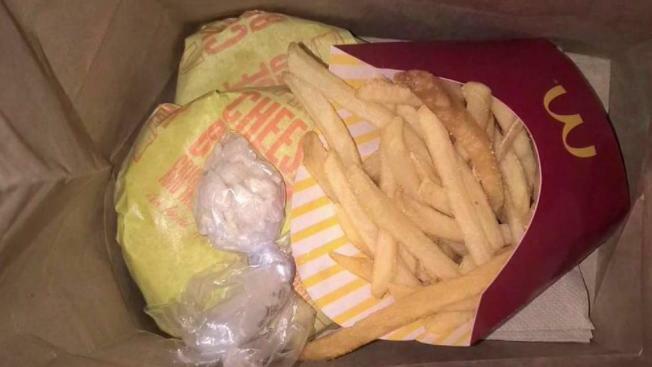 Authorities released photos Wednesday showing bags of cocaine next to cheeseburgers and fries. Prosecutors released images of cocaine inside a McDonald's bag. Police searched Guerrero’s Bronx home Wednesday and allegedly found 200 grams of cocaine. Prosecutors say $5,300 in cash was also found inside a dresser in the room of a 2-year-old child. Neighbor Joan Gravina said that police swooped in to make the arrest. "About six or seven SUVs pulled up, police got out with their shields and their jackets on," said Gravina. The child's 24-year-old mother was at the home at the time. She too was arrested and, like Guerrero, faces drug charges. The two of them were expected to be arraigned Wednesday evening in Manhattan Criminal Court. It wasn’t immediately known if Guerrero had an attorney who could comment on the charges. Authorities allege Guerrero used his position to conceal drug dealing. Tony Rodriguez, the owner and operator of the McDonald's franchise where Guerrero worked, said he is cooperating with the NYPD. "The actions of this employee are unacceptable and will not be tolerated in my organization," he said. Editor's note: A subheader in a previous version of this story initially listed the incorrect value of the drugs that were allegedly sold in the McDonald's. The story has been updated.